Let’s All Wear Blue or Yellow for Lord Jagannatha! ~ The Toronto Hare Krishna Temple! Let’s All Wear Blue or Yellow for Lord Jagannatha! Have you picked out your outfit for Ratha-Yatra (Festival of India) yet? An encouraging call goes out to all devotees to wear blue or yellow for the festival to show your love for Lord Jagannatha! This year, under the direction of Bhaktimarga Swami, our annual Ratha-Yatra parade will have an exciting twist! In an attempt to showcase our beautiful parade in a more coordinated manner, we are requesting that all devotees wear either BLUE or YELLOW on the day of the parade. 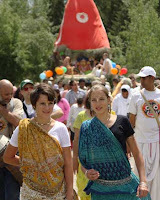 On July 16th, we will become ambassadors of our beautiful Hare Krishna culture. Let’s look organized and unified and show the people of Toronto how beautiful this festival truly is. Wear your love for Lord Jagannatha -- BLUE or YELLOW! Jaya Jagannatha!